Home > 2014 > 07/30 > Is Jake Gardiner’s five-year extension a fair comparable for Justin Schultz? Is Jake Gardiner’s five-year extension a fair comparable for Justin Schultz? On Tuesday, the Toronto Maple Leafs shifted course dramatically on defenceman Jake Gardiner, signing the former University of Wisconsin standout to a five-year contract with an annual cap hit of $4.05 million. 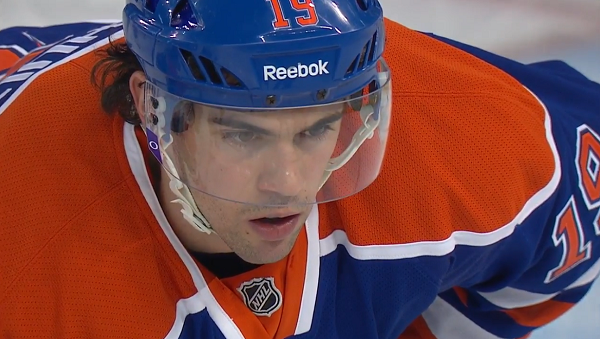 In Edmonton, meanwhile, Justin Schultz remains unsigned. Could he sign a contract comparable to the one his ex-Badgers teammate just inked? Jake Gardiner is a 6’2”, 184-pound puck-moving defenceman who turned 24 on July 4, and was originally selected by the Anaheim Ducks early in the 2008 Draft. Justin Schultz is a 6’2”, 188-pound puck-moving defenceman who turned 24 on July 6, and was originally selected by the Anaheim Ducks early in the 2008 Draft. Gardiner averaged 18:10 at evens, 2:16 on the power play and 0:37 on the penalty kill for Toronto last season. Schultz posted 18:55 at evens, 3:26 on the power play and 0:58 on the penalty kill in Edmonton. Schultz got the bigger push, but the usage was similar. Schultz’s offence is better than Gardiner’s – there are lots of ways to express this, but 60 points in 122 games vs. 65 points in 167 games is good enough for our purposes. On the other hand, Gardiner’s Relative Corsi rating has consistently been good, and while he’s had a zonestart push he has outperformed it. In other words, Toronto has out-shot the opposition by more than we would expect with Gardiner on the ice if Gardiner were an average defenceman on the team. Schultz’s Relative Corsi rating has not been nearly as good, and while he hasn’t had the same zonestart push that Gardiner has, that doesn’t make up the difference. Even measured against a terrible Oilers’ blue, the team gets out-shot with Schultz on the ice by more than the average. But even that’s hardly conclusive. Schultz has been welded to Andrew Ference and Nick Schultz for pretty much the entirety of his NHL career; Gardiner has had Cody Franson and Luke Schenn. I don’t think the world of Schenn, but do consider Franson to be the best player on that list of four by a considerable margin. In short, these guys are close; if I had to commit to one and only one for the next five seasons I don’t know which I’d choose. With the exception of Hedman, who skews the list, most of these guys look to me like they were reasonably in the range of Schultz and Gardiner when they signed their long-term deals. I don’t think $20 million or so over five years is a bargain price for a player like Schultz, but I also don’t think it’s a contract that the Oilers are going to deeply regret. At that rate, if he’s a decent second-pairing guy the team will be okay; right now that takes a bit of projection on our part but I don’t think it’s an unreasonable expectation. From Schultz’s perspective, it’s not the Hall/Eberle/RNH deal, but it’s probably as much money as he can reasonably expect at term. Where does Luke Gazdic fit in? 2014-15 goals projection series: Hall, Eberle, Nugent-Hopkins, Perron, Pouliot and Purcell,Yakupov, Arcobello and Draisaitl, Forward overview. ^true, if they’d wanted to keep Iginla, they’d have found a way. I don’t understand why hockey fans think Schultz should get what Gardiner gets. Just ask yourself, if Schultz signs the same 20.25M contract with us, will you trade Schultz for Gardiner straight? I’ll be pretty sure the Leafs will. Remember 3 or 4 years ago when the Leafs traded with the Ducks, the Leafs wanted Schultz but end up with Gardiner because the Ducks wouldn’t part with Schultz? So both the Leafs and Ducks valued Schultz higher than Gardiner. And don’t forget, Gardiner is left handed and Schultz is right handed. We all know there are more left handed defensemen than right handed so the additional value. In 2010-11, they both played for University Of Wisconsin and if I am correct, they were linemates. And Schultz had better stats than Gardiner, although in their draft year 3 years ago Gardiner was a better player. And Schultz has been the better of the two since then, IMO. Schultz got 27 pts in 48 games, prorated to over 50 pts in 82 games in his rookie year. His number dropped this season and I have no idea how much of that was to do with Eakins. Can you imagine what he will worth if he scored 50 pts this season? If you think Gardiner’s contract is reasonable, I will gladly sign Schultz to 4.25M for the same term. He is going to play with a better partner and better assistant coaches the next 2 years, it would be a stupid idea to sign a 2 year bridge contract now as I expect his number is going to sky rocket. So I prefer longer term (7-8 years) at 4.5-5.0M seeing how fast the salary goes up in the past 2 years. Just wonder how much would the Habs save if they signed PK to 6 years at 5.5M 2 years ago. @JW You missed the comparison of their NCAA stats since they played on the same team there. IIRC even those were quite similar.